As you have noticed with my last several posts, I'm still infatuated with the pelicans. And I'll try to make this post the last one of pelicans for at least a few days. For some of these shots, I was chased off by a loading dock crew. I guess I wasn't suppose to be there. Yep ... missed that sign. Oh well .... I have short term memory problems. and the beauty of their summer colors. ... like these three bad boys looking for trouble. ... to this sleeping pose. Almost as much as the evening sunsets! Hope you've had an awesome weekend. Ours was filled with a little canoeing that I'll share tomorrow. and see what you've been up to! I never get tired of your pelican shots. They make me wish I lived near the shore so I could photo them too! 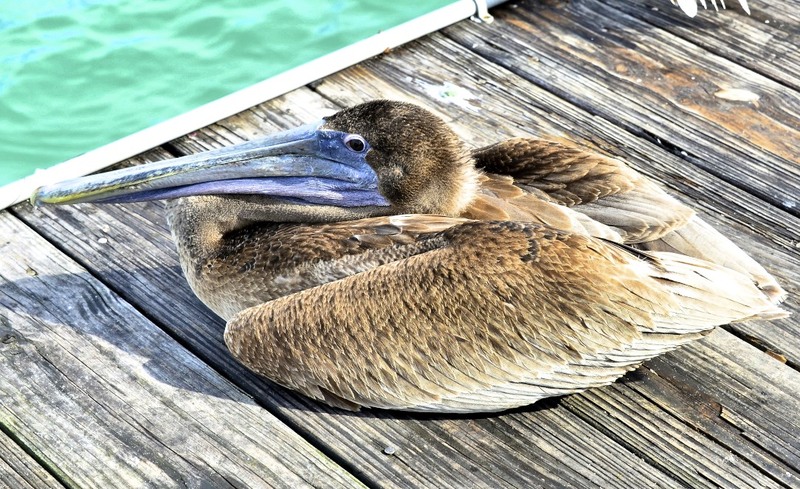 I love taking photos of pelicans too. They have so much detail with very animated bodies. AWESOME shots! How can you get so close to them without scaring them? They are probably pretty used to people eh? That sunset shot is amazing! Are the pictures what they call HDR effect? Very nice! 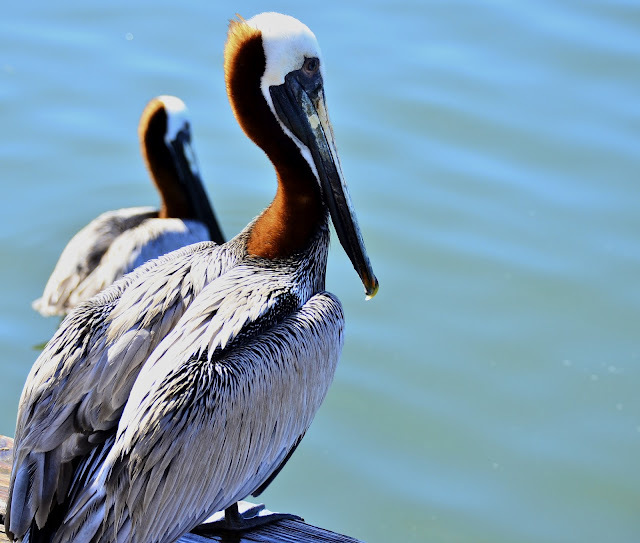 I love pelicans and you capture them so well Reena! Love the group of young tuffs looking for trouble, LOL! 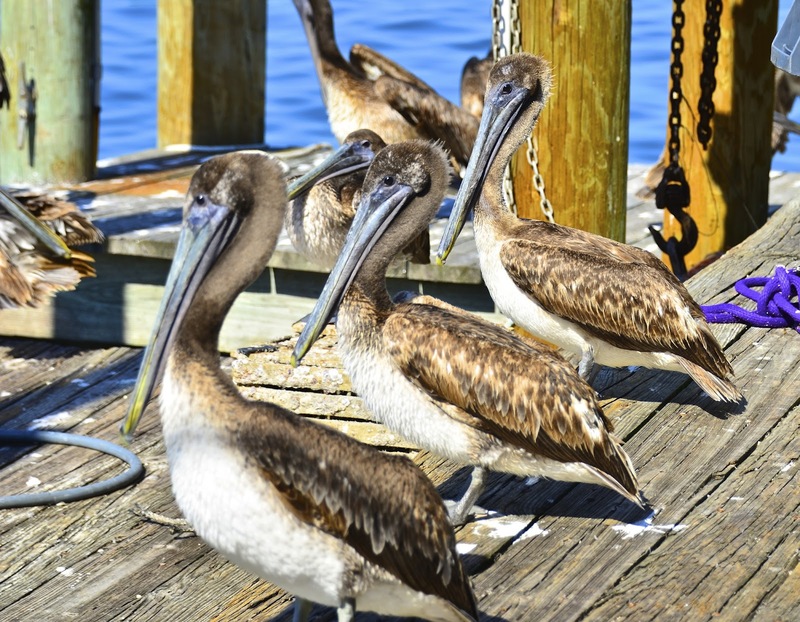 Keep those pelican pics coming! You are absolutely amazing...every single photo is brilliant and shows such personality! Great photography! I won't get tired of seeing your pelicans. Love 'em! They are such fun birds. So goofy sometimes and often too friendly for their own good. They are pretty cool, more so because I don't often see them. Your pelicans are awesome! I love how the "fold up", too! 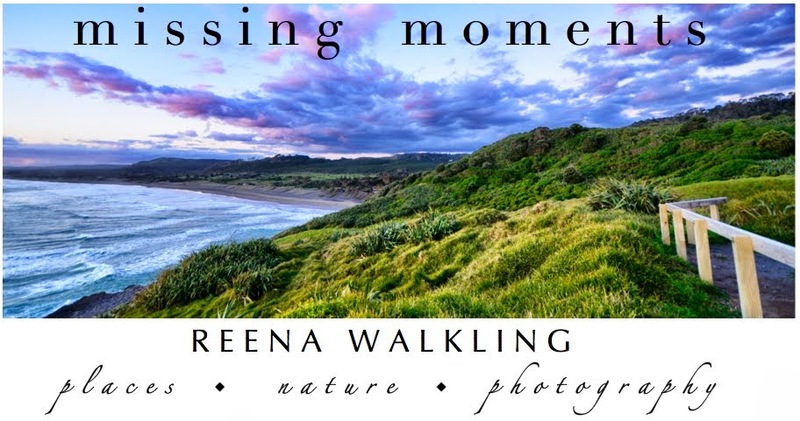 Such wonderful captures, Reena! Glad you have the short term memory problems -- a lot better than my long term ones!! Hope you've had a great weekend and a wonderful week to come! Thanks for sharing these birds. I don't get to see too many of them in these parts, so this is a treat. The adults are beautiful. Those birds sure seem to know how to soak up the sun! Wonderful - and the sunset? Fantastic! Wishing you a happy week Reena! 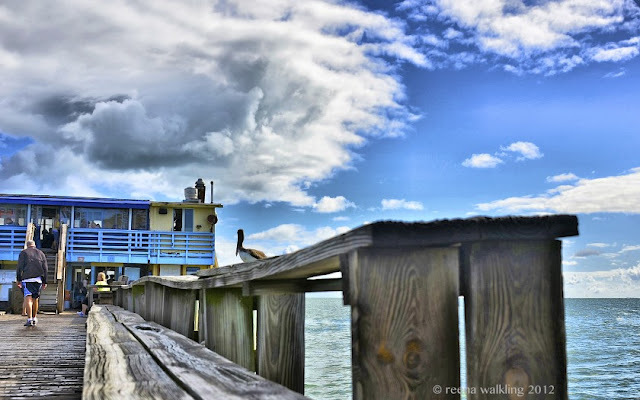 I just returned from a trip to Galveston where it is loaded with pelicans. I loved to watch them dip and dive, but graceful they are not. They literally crashed into the water, all the time I am wondering how they not break their wings. Someone told me that they only weigh less than 10 lbs, their bones are hollow. But they are absolutely fascinating to watch. Glad to see more pelican love here! Lovely photos! One day I watched as a bunch (gaggle?) of white ones synchronized their food gathering on the lake. It looked like a dance and took my breath away. Next time I will be ready with a video camera. But did they moo-moo here and moo-moo there? Your beautiful images really help me appreciate what amazing birds they are! Thanks! Great series of shots that you've given us here! We have a huge pelican population here where I live. Your shots show me just how beautiful a bird they are! 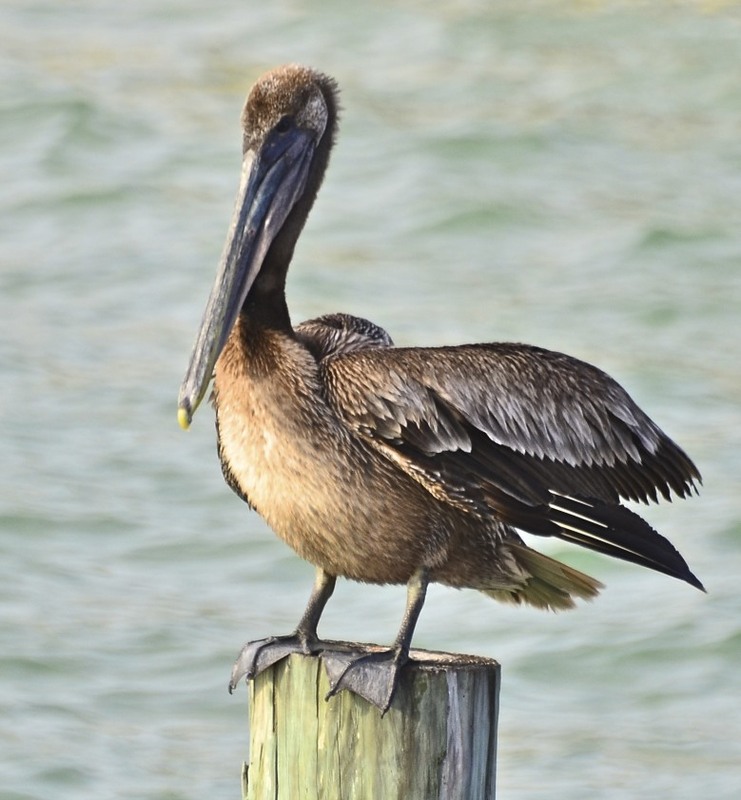 wow, reena, your pelican pictures are always majestic! they are such beautiful birds! These pelicans are amazing..and the sunset - divine! If I ever had an opportunity to be around these beautiful birds, I'm sure I would be just as infatuated as you... keep them coming, poop and all!! i have two favorites today, the one of the three in a row and the one landing on the water. i love these guys and never get tired of them. You get some of the best bird shots I have ever seen... I love the textured look of the feathers in the one picture. 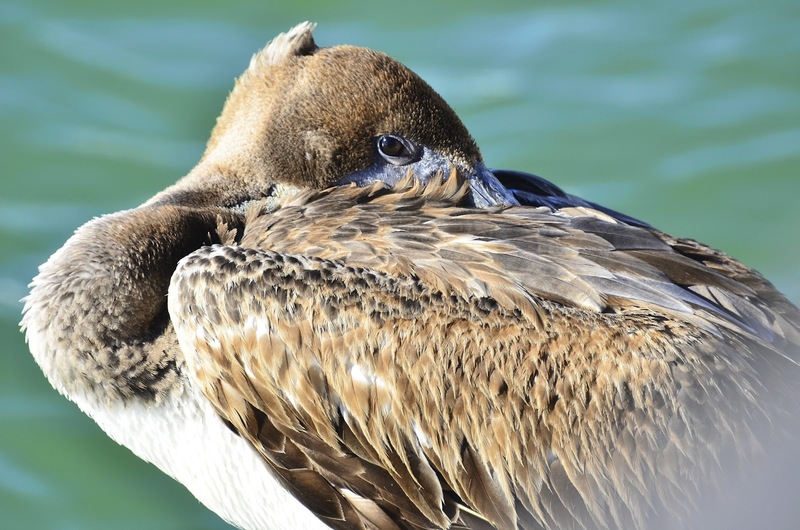 I've never noticed what the very pretty shade of brown on the pelican's neck. Actually your pictures are the best view I've ever had of a pelican. Love the pelicans, I shoot them every chance, but not as well as you. Beautiful. Just beautiful - and what amazing blues! Magnificent creatures, and you have photograped them so nicely Reena! I love pelicans, don't know what it is about them. Gorgeous pics. I love Pelicans and yours are superb, nice one. Gorgeous!! I agree with you...pelicans are amazing creatures. I love how they dive kama kazi into the ocean. I love how they fly.....it's pretty amazing stuff. I several shots coming up from Mexico several weeks ago. And that sunset.....wow! They look so absurd, and ungainly, and they you see them fly, swim and dive. Reminds me of the hidden depths in all of us. P.S. : The sunset is amazing. those detailed feathers are pretty amazing. I love seeing your pelican shots! oh my goodness...that last one made my jaw drop!! 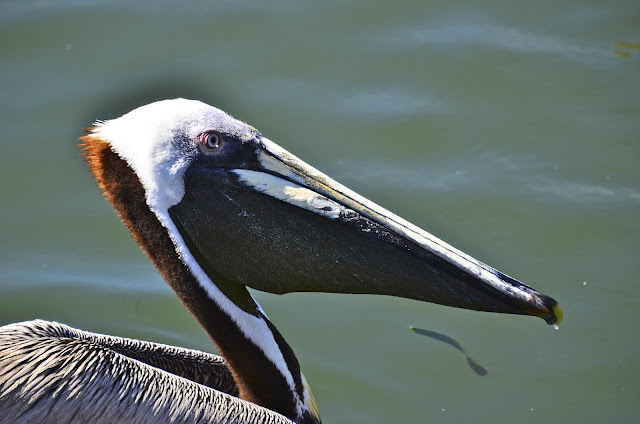 Love the pelicans, especially the blue and yellow beaks. Pelicans strike me as both peculiar and amazing - kind of an odd combination. Your fourth capture falls into the amazing category.... wonderful color, form, and composition! Your really do have a sweet life. I love canoeing. And you can show me as many Pelican photos as you wish. I love seeing them.. Love the shot of the pelican just about to hit the water. What a nice catch!! his beak can hold more than his belly can, he can store in his beak enough for a week and I don't know HOW the hell 'e can!" Part of the charm of spending time in NC is being able to watch/photograph the pelicans. Thanks for sharing these. I'm missing the mid-Atlantic coastal warmth. These photos are wonderful !!! 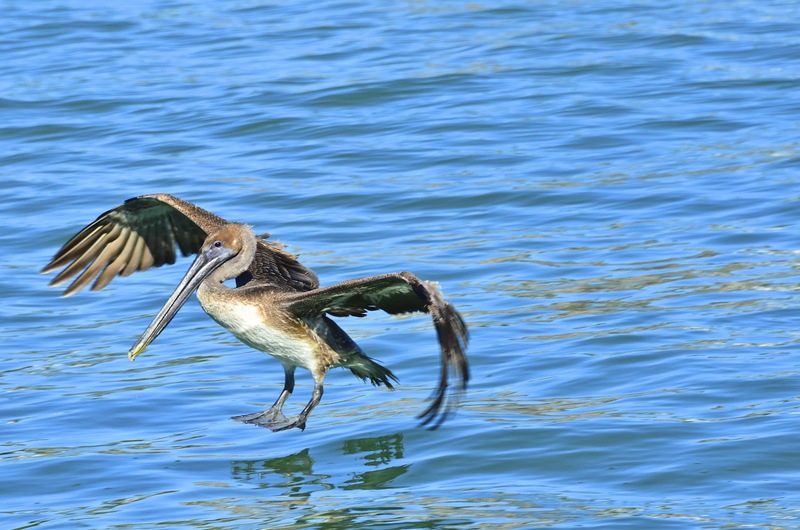 I wish we had this kind of wildlife in the UK :-) I will keep popping back in the hope of seeing some more Pelicans . Oh, I love the pelicans and sunset too. 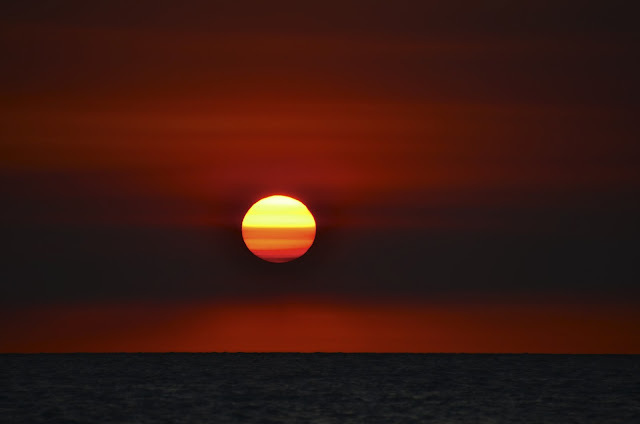 You have some awesome shots of the Pelicans and your sunset is gorgeous. Great captures. Wow... now that is a sunset! And I had no idea pelicans could "fold" like that. Fascinating!